1st row: 1. Mildred Monk 2. Elizabeth Puymbroeck. 3. Muriel Julian. 4. Mary Zimmerman. 5. Shannon Pettinger, Nellie Nelson. 2nd row: 1. Phyllis Pollard. 2. [Agnes?] Anderson. 3-4. ?. 5. Lillian Tapfer. 6. [Esther?] Erickson. 3rd row: Thomas Martin. 2-3. ?. 4. ____ Wilson. 5. Cleve White. 6. Arthur Jones (Dr.). 4th row: 1. Gilbert Johnson. 2. ? 3. Albert Johnson. 4-5. ?. 6. Katheryn Julian. 7. William Monk. Edna Kingkade [Bickner] teacher. 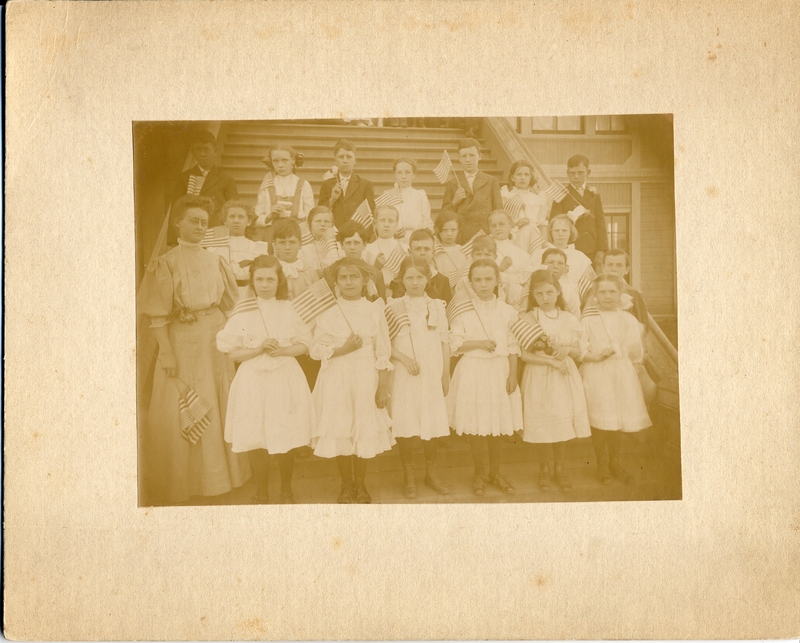 Third & fourth grades, Oswego, Oregon Public School, 1907. OL#34, OA# 34, one of 2 prints. Description Mounted on cardboard, faded.Same as 1551a & c, and 369a, b & c. See 369a for more names. Transcription 1st row: 1. Mildred Monk 2. Elizabeth Puymbroeck. 3. Muriel Julian. 4. Mary Zimmerman. 5. Shannon Pettinger, Nellie Nelson. 2nd row: 1. Phyllis Pollard. 2. [Agnes?] Anderson. 3-4. ?. 5. Lillian Tapfer. 6. [Esther?] Erickson. 3rd row: Thomas Martin. 2-3. ?. 4. ____ Wilson. 5. Cleve White. 6. Arthur Jones (Dr.). 4th row: 1. Gilbert Johnson. 2. ? 3. Albert Johnson. 4-5. ?. 6. Katheryn Julian. 7. William Monk. Edna Kingkade [Bickner] teacher. Third & fourth grades, Oswego, Oregon Public School, 1907. OL#34, OA# 34, one of 2 prints.